The Poor Knights are a choice destination for divers, but their value for snorkelling without the encumbrance of heavy dive gear, is often underrated. In this chapter we'll explore the most suitable places, complete with a map of where they are. To gain more confidence, read our snorkel course snorkelling without fear. Most of the best snorkel spots of the Poor Knights Islands are found on its western side, and most of these are located in the sheltered middle of the islands. On the eastern side, only Cave Bay is worthy of mentioning, and some snorkelling can also be done in Rocklilly Bay. Note that the eastern side is steep and deep and usually exposed to eastern swells. 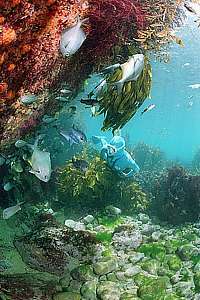 The best advantage that a snorkeldiver has over a scubadiver, is that he can venture into the wave-washed shallows where the young fish hang out. Butterfish Cove and Maomao Arch are interesting because of the variety of life, from a busy small archway with usually strong currents, to a 40m deep bottom bordered by a small cove and tall stands of the flexible weed. This is also a good night dive. Skull Bay is a very sheltered bay of about 10m depth, surrounded by steep walls. It is often mostly out of the sun, reason why charter boats prefer other places for de-compressing in between dives. From Skull Bay, venture into the passage between the two main islands, where many pinnacles abound. 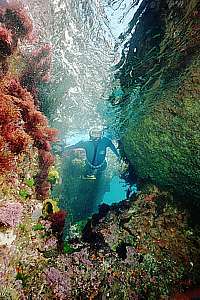 Dog-leg channel is a narrow passage suitable only for small boats, but it offers some superb snorkelling, both inside the narrow channel and outside. It also offers an interesting dive. Venture south around the point into a cove with a sandy bottom and a lot of fish in a mild current. Nursery Cove is without doubt the most suitable place for snorkelling, as the sandy bottom comes up to 2m depth. 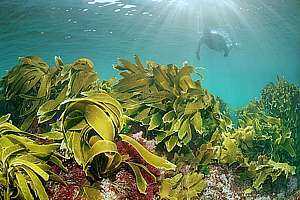 One finds resting long-tailed stingrays here and a plethora of young fish and wrasses in beautiful gardens of seaweeds. From here venture out to the Labyrinth and beyond, and attempt to traverse the Labyrinth archway. The Gardens is the preferred place for charter boats to spend lunch time, because it is large enough for several charter boats, and warm when heat radiates back from the steep walls. The snorkel area is large, although somewhat deep. Venture into and around El Torito Cave, Shag Rock, Trev's Rock and the shallows. The Natural Bridge is beautiful around high tide with large boulders and swim-throughs, and the Glade with its many passages an adventure around mid tide. From here you can also reach Jan's Tunnel and swim into Labrid Channel and across to Ngaio Rock. Ngaio Rock is close to the Natural Bridge, and offers hidden passages, cozy coves and a good variety of fish attracted to this isolated rock. Blue Maomao Arch is always a great success, although the snorkel area around is not large. During the day there won't be many fish but later in the afternoon they arrive with their stomachs pleasantly full. For most people the Labrid Channel is too deep for freediving. snorkel through the cave and around the outside. Read more about these places in the northern quarter, the mid-northern quarter, the mid-southern quarter and the southern quarter. 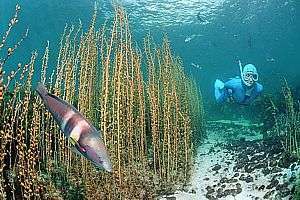 f046034: a snorkeldiver swims through a stand of featherweed in Nursery Cove. In the foreground a male Sandagers wrasse in the process of changing from female to male. 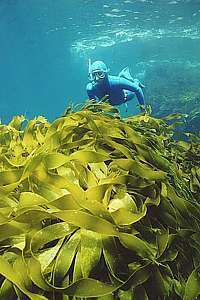 f042634: a snorkeldiver over a stand of strap kelp. f048609: snorkeldiver and yellow strap kelp. f041526: young fish abound in the shallows of Nursery Cove. f023004: Ngaio Rock has interesting nooks and passageways.